Before he learns to walk, man must first learn to crawl. While I don’t consider walking the best exercise, crawling can actually be a pretty intense workout! Crawling works your upper body, legs and core muscles, plus it can help improve your coordination. It can also turn into an intense cardio session if you keep it up for long enough! One of the most basic crawls is the bear-crawl, which involves keeping your hips high in the air with your arms and legs straight. 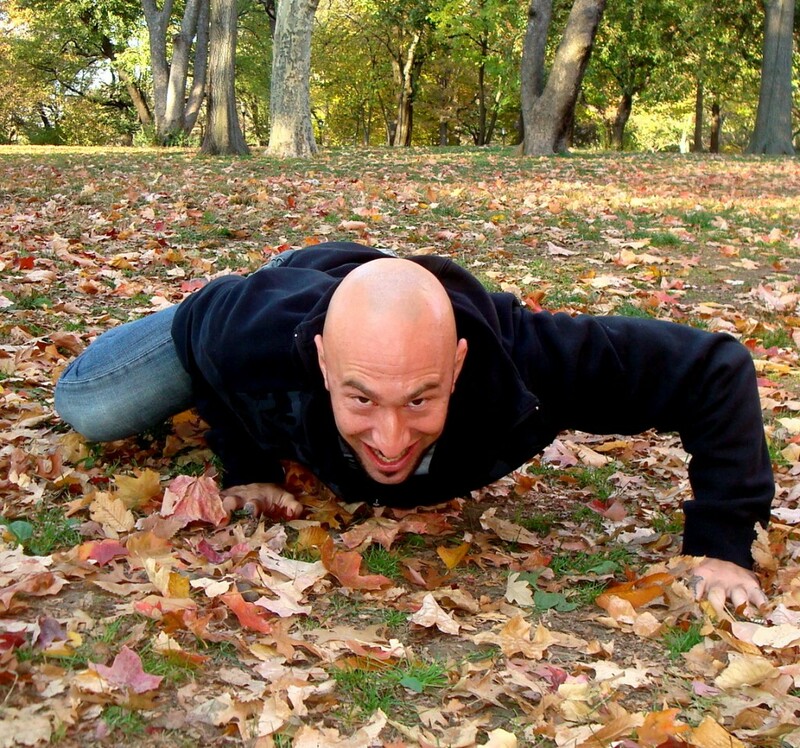 If you haven’t crawled since you were a baby, the bear crawl is a good way to ease back in. The spider-crawl is a lot harder than the bear-crawl. Instead of keeping your hips up, the spider-crawl has you bending your arms and legs while keeping your hips down. Imagine you are trying to get through a narrow tunnel without letting your belly touch the ground. Whichever variation you choose, crawling makes a great warm-up exercise, conditioning drill or active recovery technique. Feel free to experiment with different ways of incorporating these crawls (and your own versions of them) into your workouts. If you’d like an Al Kavadlo/We’re Working Out! T-shirt like the one I’m wearing in the video, they are now available for purchase! Uh oh… you’re cheating on Tompkins Square Park? Haha Tompkins is still my #1, Jim! C’mon John – you know you love it all! Dude, you’re such a tool. Thanks for taking the time to comment, Robb. It means a lot to me. Your name is Robb Dobb……and your calling him a tool? It’s crazy how much crawling can exhaust me. I was once at a rugby bootcamp. All the jogs, jumps, and random miscellany were ok. Then we had to bearcrawl and I nearly died. It’s amazing isn’t it? Crawling is intense! Haha – good one, Hooch! Pingback: Jumbo Shrimp Squats, Wolverine Push-ups and More! Crawling is one of my favorite workouts. The Spider Crawl is my favoirte, I’m for sure going to adopt the “Grok” Crawl into the mix. Another way I like to move around is in your “Beginning Parkour” video that you use as a warm up starting at 0:28 of the video. Right on! There’s a lot of ways to vary these movement patterns!